One of the most satisfying things to feed my babies (besides mama’s milk!) has been bone broth. 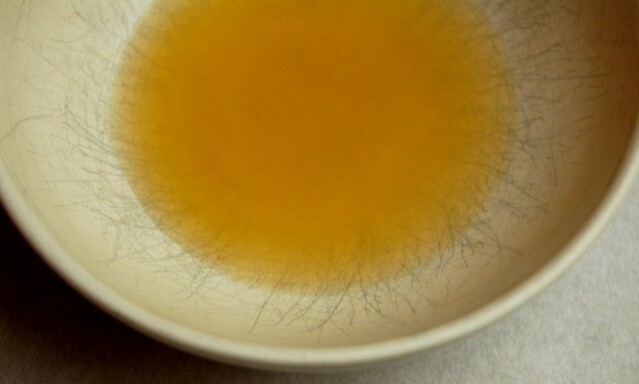 If you have never read Broth is Beautiful before – take a peek! 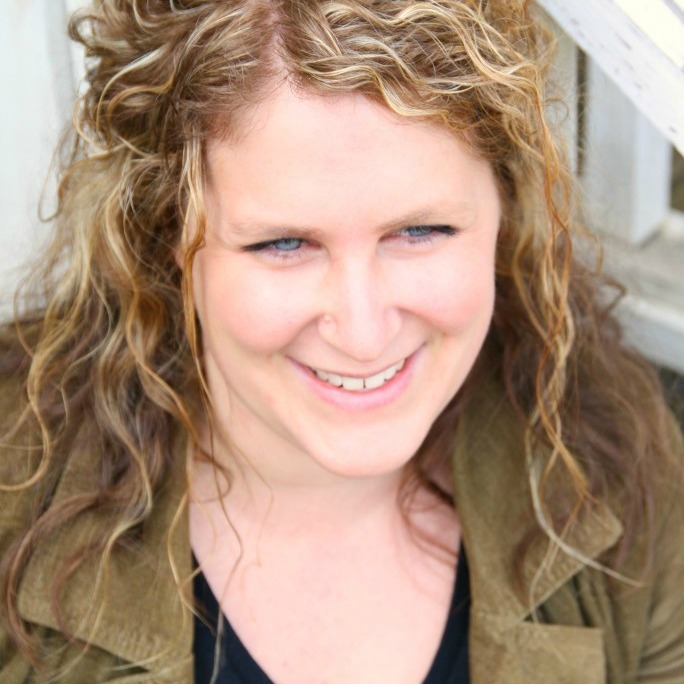 You will be so proud of yourself for getting bone broth into not only your kids – but YOURSELF! Bone broth made from healthy pastured cows and chickens is extremely nourishing – full of vital minerals, and protein rich, digestive assisting, gelatin that you just can’t get anywhere else. I have found that creating a taste palate for bone broth in my kids has helped immensely down the road for having healthy eaters of beautiful veggie soups, and broth straight out of the sippy cup when they feel under the weather. My big girls (age 4 and 2) drink it right out of the pot with a sprinkle of sea salt. I can’t tell you how many times I have relied on just a cup of broth as a lunchtime staple – especially during the busy toddler years when they just don’t want to sit and eat – they want to play! So right around 5 months I start with little tastes of bone broth with a sprinkle of sea salt. It gets messier than I want to deal with on a spoon right at first, so I use a little dropper or syringe! I usually have one lying around left over from little herbal bottles of chamomile. You can also go to your local pharmacy and ask them for a medicine syringe – ours gives them out for free. Just a tablespoon or so right in the beginning. Within a few times of trying it, all 3 of my girls now have been so in love with it they literally grab for the syringe to put it in their mouth! I don’t always have jars of bone broth in the fridge to pour from – it usually goes right from the pot into making soup, or into the deep freezer until I need it. 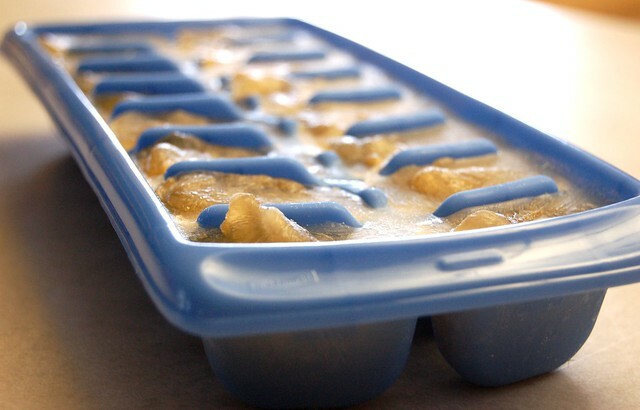 So while I’m straining out my broth, I usually freeze up an ice cube tray or two with broth so I can pop out cubes for baby as I need. 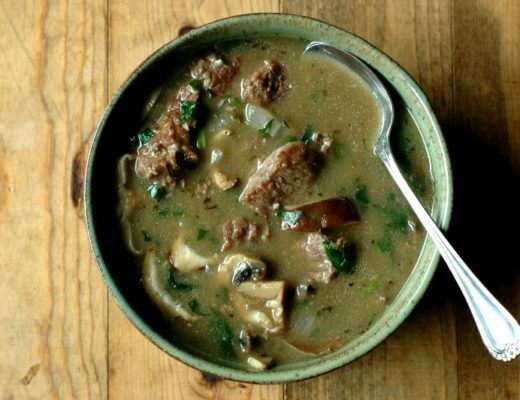 DO NOT warm up the broth in the microwave – it will kill all the good stuff! Use the stove top, OR I like to just put it in a little container in my bottle warmer! From there the possibilities are endless! 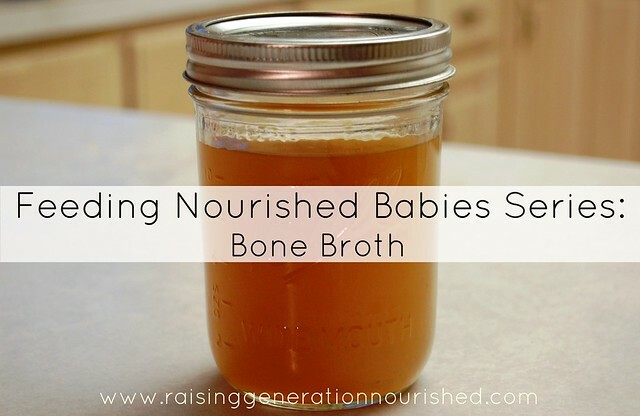 I use bone broth as the base for pureeing all of my meats and veggies for baby. Veggie soup purees are a meal staple in our house, not only because they are so easy to make, but because it is a great way to get bone broth in my family. I start baby tasting simple pea soups, squash soups, etc at some point between 6-8 months. 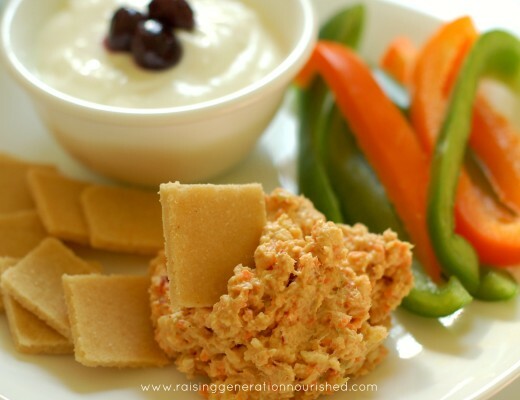 It is such a nice meal staple to get baby’s taste palate used to so that they can continue to eat these great soups into toddlerhood and beyond. So HERE is my method for bone broth making! Give it a try and let me know how it goes! Remember – it can take up to 15 attempts of a new food for baby to accept the new food! This is the same for all first foods! If baby makes a funny face at first, don’t give up! They are getting used to new tastes, textures, and feelings in their mouth! Give them a chance to learn how this feels, how to use their tongue, etc! Watch baby for a week during those first introductions. If you see any weird diaper action going on, redness around the mouth, or rashes on the skin, you will want to stop. Try the broth again in a month and see what happens. I have a question about introducing bone broth when introducing solids. I know when making the broth, you add carrots, onions, etc to it. If your baby has never had these vegetables before, do you have to worry about allergy possibilities? If there was a reaction, how would you know which food it was? Or does it not apply if they only have the broth? Hi Chelsey! I wouldn’t worry about the veggies in the broth – if you notice a reaction you can certainly back off but honestly I have heard of just about every reaction to just about any type of food with babies and bone broth is never one of them! I usually started bone broth off a syringe or spoon around 5 months and I rarely had the veggies all introduced at that point. I hope that helps! Hi, it is so fun to read your blog!!!!!! Thanks Renee! 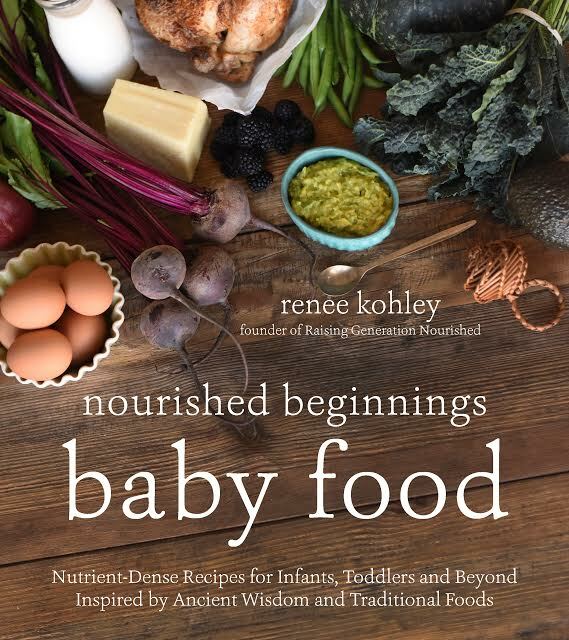 I have a month old sweetheart so I started to do some research on first baby food. I am also going to teach it afterwards my mom, she has a nice stainless pressure cooker which should be great for it, right. Whole my childhood we had soups for a lunch time, lots of time from a chicken broth and generally people from the Czech republic where I come from do it daily but I don’t think they know about a BONE broth! So I am going to tell everyone that they can get something so great from bones!!! My second question is that my mum can’t afford to buy organic chicken, will it still be a health elixir? And third – you wrote DO not microwawe it – ok, I did :-/ so does it really mean that my baby actually didn’t get anything good from it? I won’t do it anymore but OK, does it really destroy all the good stuff? Sorry to bring one more question – what about putting a clove of garlic in it? YES the broth left after making a chicken is called meat stock, and while it doesn’t have all of the same properties as bone broth it is very nutritious and I use it for sure! SOups, stews, gravies, boiling rice etc! Save it and then save the bones and make bone broth! As far as the animal…I always say buy the best you can afford – making homemade bone broth is always, always going to be better than buying store bought! Yes no microwave – it really does kill everything off! Just use the stovetop next time! And yes for sure on the garlic! Go for it! Hi! How much bone broth do you give to a six month old as a first food? Do I need to be careful since its a liquid? Hi Brooke! 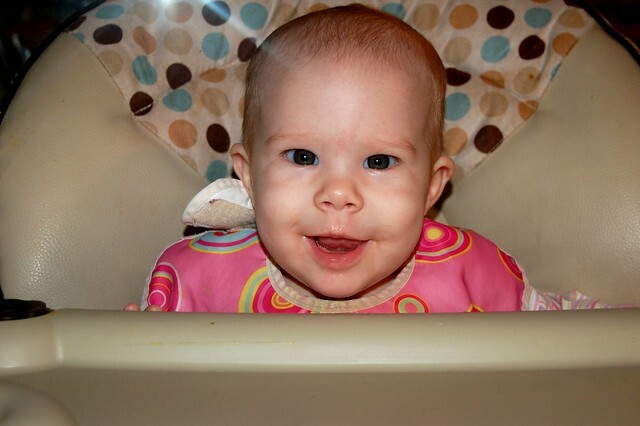 I started out with a couple tablespoons with my 5 month olds – I would say start out with that and go from there. One of my girls would take a good half cup at a time by 7 or 8 months. Follow baby’s lead – At 6 months still nurse or formula first and then solids afterward. I switch that closer to a year old doing solids first and then nursing. It is pretty hard to over feed a baby. So if you nurse or bottle first and then offer the bone broth they will let you know when they are done 🙂 Does that help? My little one is 6months 21 days old. I put some beef bone broth in a bottle and he drank a bit; then threw it all up. . I have given him a little banana and he’s thrown that up too. So I’m sticking with breastmilk for now. Any thoughts? Hi Rose! I would start a bit slower – a bottle was probably giving it to him faster than he was used to. 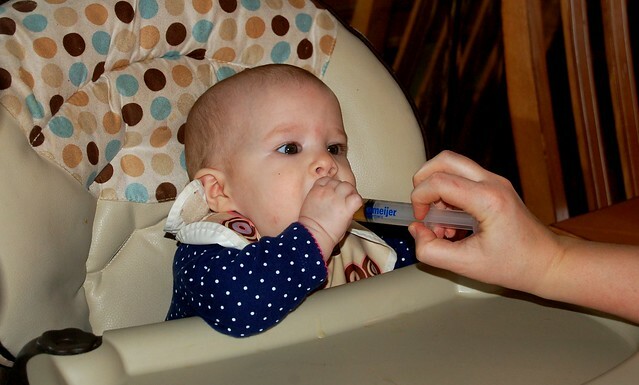 Start very slow – I don’t usually give more than a spoonful or 2 the first time I give a baby any new food. I hope that helps! I believe the microwave would kill enzymes, but there is still beneficial vitamins and minerals left. (I am not a microwave fan, but just wanted to say it was still nourishing- just not as). Hello! Thanks so much for this information. I just made my first batch of bone broth. My question is, how to I let it cool? I’ve heard leaving it out to sit and cool on the counter can bring bacteria??? But putting it in the fridge hot is also a no-no…What is your method for cooling, then storing broth? Hi Kishia! I cool my bone broth on the counter for a bit and then into the fridge to cool the rest of the way – it is usually warm to touch but not hot. Sometimes I forget about it and it ends up at room temp. 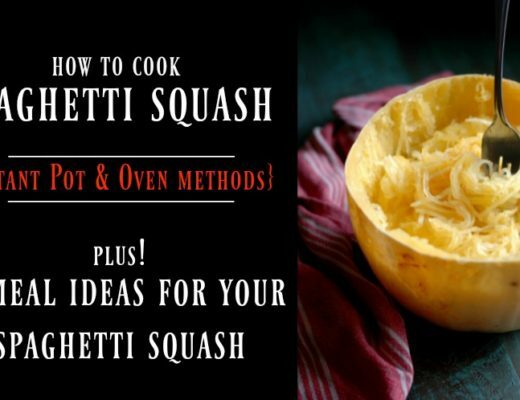 You can also quickly cool it by placing it in the smaller of two bowls that nest. Fill the larger bowl with ice and place the smaller bowl in it. Replenish/replace the ice as needed. Renee, You say you start with a couple of tablespoons a day. What is the rate in which you increase that? 2 tablespoons for a month? A week? At what point is the baby drinking a bottle of bone broth? 1 year? My little one is 5 months old and I started introducing taste of bone broth and I’m wondering at what rate I can start increasing the consumption and how that plays out. That just depends on how baby is doing with it! It really varies. If baby is loving it and even reaching for more, go ahead and bump it up. The small amount to start is just to keep an eye on baby for a few days to ensure they don’t react to it in any way. From there, you can give baby as much as they desire. They will tell you when they are done for sure. Love your post…burning question for me…do I need to remove the fat from the broth before giving to my 6 month old? Hi Sophia! I don’t worry about a little fat – I do skim the fat because I use it for cooking with. There is nothing wrong with it though so you can leave it if you wish. If I am starting my 6 month old on bone broth(first thing I’m giving her other than BM) would I do that for 3 days then I can add like avocado or something in addition…. Have you heard of bonafide provisions bone broth? Thoughts? Hi Summer! Yes, I would feed the bone broth here and there over a few days to watch for reactions and then add a new food. I have not heard of Bonafide Provisions. I work with Kettle and Fire and like their process if you are looking for one to purchase! Hello, my kids are two and four. How much can I give them a day and how long will it last in the fridge? Thanks! Hi Jessica! They can have as much as they wish. My kids drink bone broth based veggie soups almost daily – definitely daily in the winter. Including my toddler. Just to get an “underline” to your answer to Chelsey’s question above…I am making bone broth like I usually would with onion and garlic and with a chicken that was seasoned with thyme, rosemary, salt, and pepper. I was all excited to be preparing my baby’s first broth, but then I got nervous about whether or not the additional ingredients will be too much for Baby all at once. Would it be better to freeze and save this broth and start the baby on a very plain broth instead? Thanks so much. Oh gosh I love that Abigail 🙂 Thank you for sharing! Should the bone broth be plain, if I am using it as my baby’s first food outside of breast milk? Or can I add vegetables to flavor the stock and add more nutrients? Hi Elsa! Yes, you can add some veg for flavor and nutrients – all of my girls started bone broth around 5 months old made with veg. Hi, If buying a bone broth how much sodium is acceptable for baby, you mentioned Kettle and fire broth? Hi Kristina! Kettle and Fire broth would be fine for baby – I would serve it. I usually salted my broth for baby a tad under what my preference would be. My baby is 3 months old and he’s a big boy. The doctor suggested I put cereal in his bottle for his acid reflux and I’m not 100% ok with that. So I looked into giving bone broth and wondered if he’s still to young. He is formula fed cause of milk allergies. I have an autoimmune disease and my two oldest are speech delayed. I suspect my son is high functioning autism but we haven’t gotten a diagnosis yet. We are working on gut healing to help them developmentally recover from their delays. I have an almost 4 month old. I am doing everything nutritionally different with him. I have read for gut healing to start baby at 6 months for 2 to 4 weeks on only bone broth to start with then move toward a nutritionally dense diet like liver meats and certain veggies. What do you think about that? And how much just I increase if he tolerates a small amount? How much should Inwork up to for that period of time of only bone broth? Thank you for your time! I purchased the bone broth from kettle and Fire. I have a 6 month old and i started with 4 tablespoons for two days now once a day. So far no no bad reactions. I’m concern is the sodium. 280mg per serving a cup. I guess if I’m giving him the 4 tablespoons I should be ok? How long will it take to seal the gut? I’m doing only the bone broth for a week before introducing solids again. Because his stool was solid but Soft with the butter squash. Hi Yersenia! Babies need sea salt too, so I wouldn’t worry about the salt in the bone broth. Gut sealing really varies from person to person, so it is hard to say how long and whether there would be other factors playing in like needing probiotics or other gut sealing supplements. A soft stool with squash doesn’t necessarily mean a leaky gut either – baby is getting used to new things to digest and that can take time. Avocado and grassfed/pastured meat and liver are great first foods as well.